Strange that we read about the toxic waste being buried under Beaconsfield Tasmania in the Sydney Morning Herald but not in its Fairfax cousin the Launceston Examiner. As usual we have to do what the Examiner fails to do. Bring you the news. "AS IF befitting its tumultuous history of corporate conflict and human tragedy, the life of the Tasmania Mine at Beaconsfield seems destined to end in controversy. It was first mined during the gold rush years, was closed at the outset of World War I in 1914, and did not reopen again until 1999. It has produced 1.95 million ounces of gold over the years, worth more than $3 billion at today's gold prices, and its resources remain ''open at depth''. Yet now, with no resistance from government or regulators, management is preparing to dump 300,000 tonnes of tailings - mining leftovers thick with arsenic, cyanide and other toxins - straight back into the underground mine itself, risking ultimately poisonous seepage into the water table. This might seem an acceptable risk if the mine were way out in the desert. 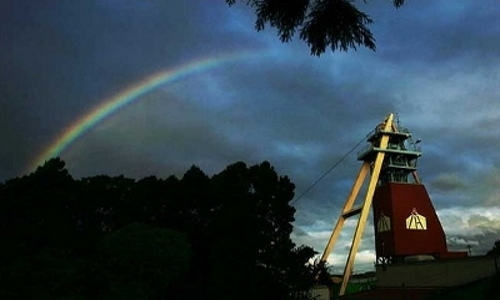 Rather, the historic Tasmania Mine, with its famous red and yellow headframe, is situated smack-bang in the middle of the township of Beaconsfield in northern Tasmania. This is the very mine whose fateful collapse on Anzac Day in 2006 killed miner Larry Knight and trapped Todd Russell and Brant Webb 925 metres underground, until the euphoria of their rescue 15 days later. Now accusations swirl that the company which runs the mine, BCD Resources, is pursuing a ''quick fix'' to satisfy its environment bond requirements with the state government and keep its clean-up costs to a bare minimum - at the expense of future generations. There are two main allegations: one of ''resource vandalism'' as there is significant existing gold, even apart from the potential for further discovery, and the second of environmental folly. ''They [the company and the regulators] are deliberately burying a valuable long-term gold resource,'' says a dissident BCD shareholder, Will Matthews. And it is all being carried out, says Matthews, without a proper independent environmental report being required by the Tasmanian Environmental Protection Agency. Both the company and the EPA reject Matthews' claims. Chief executive Peter Thompson said the plan had been endorsed by the EPA and Mineral Resources Tasmania. Piping tailings back into an underground mine, indeed the whole mine Closure and Rehabilitation Plan they claim is ''world's best practice''. Yet Matthews responds, and his views are supported by others au fait with the Tasmania Mine, that significant underground resources, open at depth, have never before been sterilised this way in Australia. It should be said that the mining fraternity in Tasmania is tight-knit and few critics of the BCD proposal were prepared to speak against the industry and government on the record. On background, however, sources were scathing, calling into doubt the claim that the toxic sediment would stay, effectively capped, down underground without effecting groundwater. ''Unless it is rapidly halted, this may go down in history as Australia's worst case of environmental and resource vandalism,'' says one mining industry veteran. Once the mine flooded again, the toxins would ultimately mix with the water system. Over the past two weeks, Weekend Business has put detailed questions to the EPA and Mineral Resources Tasmania. A picture has emerged of a mine closure plan devised by the mine's management to be less environmentally cautious than cost effective. ''It's all about the money,'' is the way Matthews frames it. He says BCD has sought the cheapest way to get its $2 million to $3 million back from the government - the two parties are even in a legal dispute - and this is their effective settlement. Further, mine management is risk averse on mining deeper at Beaconsfield, even if there is gold there, so putting the operation on ''care and maintenance'' was discarded as an option. It is the regulators however who ultimately preside over the fate of the mine. And critically, no formal EPA Environmental Effects Report has been requested or produced which assesses the risk of dumping the tailings down the mine. It barely rates a mention in the EPA's public materials. The EPA and Mineral Resources Tasmania have merely signed the company's mine closure proposal rather than insisting on a rigorous, independently prepared and publicly available environmental effects report. On May 30 this year, in a presentation to the Beaconsfield community, BCD's Thompson presented the Tasmania mine as a ''depleted resource''. A closure and rehabilitation plan was laid out. It was to recover the sulphide tailings in the surface TSF2 dam, and pipe them into the mine, three kilometres away, rather than cap the dam which is usual practice. Further, old tailings from Lefroy, across the Tamar River, would be trucked to Beaconsfield, treated with cyanide to recover residual gold and, finally, also piped into the mine.Matthews calls it madness. As he says, why not leave the sulphide tailings where they are and simply pipe the retreated Lefroy tailings into TSF2 to cap the sulphide tailings. When the TSF2 dam was constructed, the EPA required it to be lined with plastic, the industry standard, and so all the sulphide tailings and Lefroy tailings would never affect local groundwater. But back to the claims of a ''depleted resource'', even the company's own statements to the Australian Stock Exchange from months earlier show BCD had begun downplaying the potential for further goldmining. Changes in technology and a higher gold price would surely make this resource a viable mine again, says Matthews. How much gold remains at Beaconsfield is a matter for conjecture but the label ''depleted resource'' does appear questionable. BCD's half-year financial report to December 31, 2011 included reported ''identified gold resources'', as at June 30, 2011, totalling 334,000 ounces (1,011,000 tonnes at an average grade of 10.3 g/t gold). That is a lot of gold. Since then, BCD reported total gold production for the 2011-12 year of 44,829 ounces of gold. Allowing for likely mining and treatment losses, gold resources would have been depleted by up to 56,000 ounces, say sources close to the project. ''Remaining identified gold resources in the Tasmania Mine would currently exceed 275,000 ounces of gold,'' one source told Weekend Business. By comparison, Henty, Tasmania's only current operating goldmine, on February 23, 2012, reported total mineral resources, as at December 2011, of 326,000 ounces of gold (2,081,000 tonnes at 4.9 g/t gold). Therefore the Tasmania Mine contains the largest and highest grade gold resource in the state. ''Mineral Resources Tasmania stands behind its previous response that the proposed actions will ensure the best environmental, economic and community outcome during and after mine closure,'' it responded in a statement. Still, at the current gold price of about $1530 an ounce, the Tasmania Mine resources of more than 275,000 ounces are worth more than $420 million in the ground. The reality is that both technology and gold prices do, inevitably, change. They will change. As will the value of paper currency and the Australian dollar. The Australian dollar gold price has risen consistently and inexorably in recent times, trebling over the last seven years. Some commentators, including the chief executive of the world's biggest goldminer Newmont Mining Corp, would say that gold is the only real form of money (it can't be printed) and a further trebling in price over the next seven years to $4500 an ounce is a very possible outcome. There is of course an element of ''he would say that, wouldn't he'', but a much higher gold price is more than just plausible, it is likely at some stage as easily extractable gold resources around the world become depleted. BCD's Thompson said it would be possible to simply drill through the tailings if a rising gold price were to make the mine economic again. One goldminer said however the cost would be prohibitive. ''Sinking a decline and new ventilation shafts from surface to 1250 metres shouldn't cost much more than $200 million," was the sarcastic response. ''Historically, around 1 million ounces of gold was mined from the Tasmania Mine between 1877 and 1914. Between 1999 and 2012, around 1 million ounces of additional gold has been mined,'' said Matthews. ''There is no geological reason why there is not at least another 1 million ounces left in the Tasmania Mine for the future benefit of Tasmania, the Tamar Valley and Beaconsfield. When the mine closed in 1914, the engineers and geologists at that time also said that the Tasmania Mine had no future. And of course the world knows that they were very wrong". Very disappointing to read this article. From what I understand putting the old tailing back underground is by far the best option to deal with them and anyone concerned should contact epa. It would be disappointing if these incorrect claims result in BCD not going ahead with removing all the tailings from Middle Arm. I think the Middle Arm project is potentially a great project that would see middle arm returned to pre mining condition and all the old tailing put back where they came from. BCD have got their mill up of sale, if it is sold the tailing will basically never be removed from Middle Arm. Issues(even though incorrect) and negative press about putting tailings back underground is going to cause incorrect negative sentiment about the project and make it I suspect far more difficult for the project to happen/be approved. Could easily see BCD just selling mill and moving on and a great project for the environment and jobs not going ahead. I don't know what Will Matthew's agenda is I recon there is more going on here than meets the eye. Reading the article I get the feeling he is a dissatisfied shareholder who doesn't want the mine closed permanently and will do anything, even spread incorrect information to see that happen. Terry Smith. BCD wont process the Middle Arm tailings until 2014 - 2 years after the gold mine closed. The mine will have filled with a lot of water by then. That means the cyanide waste will go in after the groundwater. Remember everybody North of Beauty Point has no town water, only tanks and wells. Beauty Point is only 2 kilometres North of the mine. The EPA has already let BCD pump toxic waste underground so why bother with them?